What can you tell me regarding protective riding helmets? Do helmets basically provide a false sense of security for the rider, or have they been proven to provide adequate protection and recommended to be used at all times? Does quality/protection ability increase with the cost? Which one(s) would you recommend? The helments will be for mid-age novice adult women. I wear a helmet now. Didn't when I was younger & barrel racing but decided I needed to protect the brain cells I had left when I started riding again. Helmets won't prevent all injuries but they will protect the brain and reduce the number of severe head injuries. There are several people on DE that have had close calls and their helmet may have saved them from much more serious injuries. The helmet should be for horse riding and ASTM/SEI certified. Try several helmets on to find one that is comfortable because if it's not comfy, you're not going to want to wear it. Also, under NO circumstances EVER look in a mirror while wearing your helmet. I have a Troxel Dakota that is comfortable and surprisingly not hot even in the sun. In fact, I forget about it sometimes & clunk my head on the saddle compartment door when I get back to the trailer. Both Mrs Hook and I wear a helmet every time we ride. ( Mrs hook does use a proper English riding helmet for showing English and a Western hat when showing western. Our helmets are Troxel. Mine is a steel blue finish and Mrs Hook's is a deep shiny green colour. 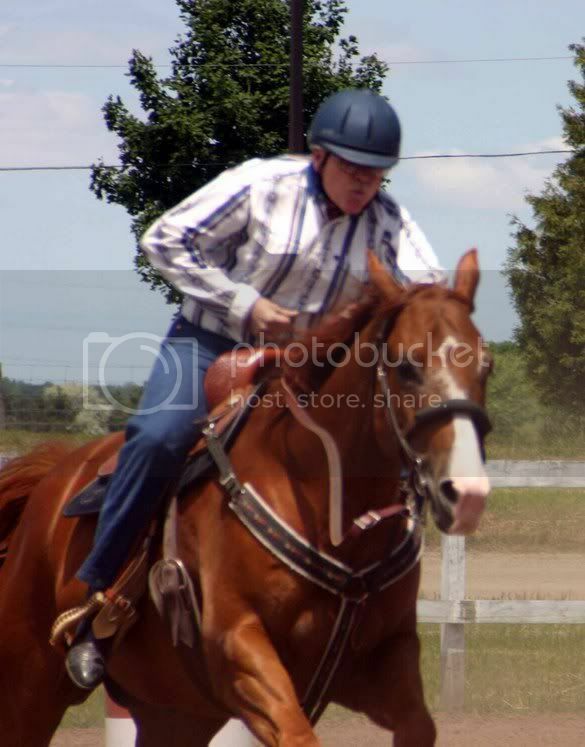 Here is a picture of me in my helmet riding my horse Hook. A friend / neighbour was killed this year from a fall from her horse. A helmet would have saved her life. wearing a helmet is like wearing a seat belt. Good insurance against a bad accident. They do give more then a false sense of safety. They have been proven to help but like what was said not in all injuries. If you head is snapped the right way you can get neck injuries and things like that. I have broke, really broke two helmets now. Both where on falls, one was when my mare fell with me riding which is the time I mess up me hips pretty good. In both cases I had hurts in other places but baiscly my head was okay(as okay as my head is anyway! lol) but the helmet was cracked in a few places. Fit is very important. I had one brand that I have had a number of over the years and I thought it was a good fit until I tried one that was on sale and I LOVE it. Last weekend I let a friend use my new one when she came out to ride my one mare and I used the old one....I wanted the new one back! Helmets come in two groups. The ones that are ASTM/SEI certified and the ones that aren't and are just for looks for showing english. Since the ASTM/SEI has strong guide lines and rules most ASTM/SEI certified helmets are fine and price does mean that they are better. Many of the high priced ones are just paying for the name or the look, sometimes the fit if they have an odd head. I would say that fit and quaility are more important then price. Most of my helmets I have paid from $20-50 for depending on if I got them on sale or not. I think the cheapest one I got was my new one and I got it at over half off so shop for deals if you find the one that fits you the best is higher then what you want to pay. I can't see spending huge bucks on a helmet when they do need to be replaced from time to time. I think that most companies well let you send a helmet in for testing after a fall, I know the two brands I have do. After a fall the helmet can look fine but be damaged. Some companies will sell replacement helmets at a lower price when they test them and find they are no longer safe. The care of a helmet is important. No leaving it in a hot car, tossing it around, etc. 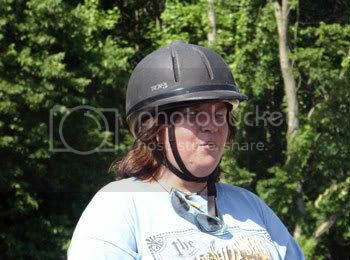 Mrs Hook's helmet is an International, not a Troxel. site. It is lighter than my Troxel - Legacy. She has had it since 1999. I got mine last year when I was working with Hook to train him for speed events. Found this article on helmets.Helps to explain how they work. An ASTM-approved helmet is pricey but worth it. We'll tell you why, what's available, and what to look for. You ride? You're going to fall off. Involuntary dismounts are an occupational hazard of riding, on the flat as well as over fences, and even the best riders do their share (ask George Morris, or Anne Kursinski, or Karen O'Connor, or Stephen Bradley, or . . . ). When you do fall, you could hit your head. And depending on what your head hits and what it's wearing, you could end up with anything from a mild headache to a concussion to the end of your riding career. Yes, such helmets are on the expensive side (from about $50 to $130, depending on materials and style), and yes, in most cases they're a little larger and heavier than non-approved helmets. But once you understand how they work and why they are the best protection you can give your head, we think you'll agree that you can't responsibly afford anything less. Although details of design and construction vary by manufacturer and model, the major component all ASTM/SEI-approved helmets have in common is a polystyrene liner capable of absorbing much of the impact from a blow to the covered part of the head. That liner is what makes approved helmets slightly thicker than most non-approved ones (maybe five eighths of an inch to an inch, estimates Dean Pope, customer-service manager for Lexington Safety Products, one of the five manufacturers now producing approved helmets). How about non-approved helmets? Either inside or on the box, all riding helmets not manufactured and tested according to ASTM standards carry a warning label stating, in part, that the helmet is an item of apparel only and will provide no protection to the user's head from a fall or other source of impact. Some such helmets may provide some protection, but none can claim the kind of proven track record that an ASTM/SEI helmet can. Just what gets tested, and how? The ASTM standard requires both a helmet's impact-absorption ability and its retention system -the harness - to be tested. To test impact absorption, the helmet is buckled onto a headform as it would be on a rider's head and dropped in free fall, both onto a flat steel surface (simulating a fall onto a roadway or hard-packed arena) and onto the edge of a sharp ninety-degree angle that crowns a device called an "equestrian hazard anvil" (simulating a fall onto a rock or curb, or a kick from a hoof). Instruments measure how much impact travels through the helmet and reaches the head; if it's more than 300 G, the helmet fails to receive approval. To test the harness, the helmet is again buckled onto a headform and then given a sharp mechanical jerk, simulating the force with which it might be jerked about on a rider's head in a fall; to pass, the buckle must stay closed and the chinstrap mustn't stretch beyond a defined amount. Proven protective headgear, and standards defining what constitutes protection, are relatively new in horse sports. In 1983 the United States Pony Club, then three years into a twelve-year tracking study of accidents reported by local chapters all over the country, developed its own minimum "Pony Club Standard" that all helmets worn by members had to meet, sponsored independent testing of helmets, and published a list of those that met the standard. A year later, the American Horse Shows Association required junior riders - those eighteen years old and under - to wear protective (though not necessarily USPC Standard) headgear with a secured harness at AHSA-sanctioned competitions. Not satisfied with its own standard, in 1986 USPC asked ASTM, which had developed headgear standards for other sports, to do the same for riding helmets. Over three and a half years, an ASTM subcommittee consulted individual riders, horse-sport federations, racing interests, and other ASTM athletic-equipment committees, as well as engineers, manufacturers, and materials-testing specialists, among others. The subcommittee's goal was a standard geared toward protecting the head from a single major blow occurring during the kind of accident most likely to happen to a rider: a fall from a horse at speeds anywhere from a walk to a gallop. In 1990, ASTM published the specification, known as ASTM F 1163, now recognized as the safety standard for riding helmets, describing basic construction considerations and laying out in detail the testing process for helmet evaluation. SEI, a separate organization, then took on the job of administering the certification program, contracting with an independent facility to test helmets as prescribed by ASTM. Like all ASTM standards, F 1163 will be reviewed at least once every five years and either reapproved, revised, or withdrawn; the Society (located at 1916 Race Street, Philadelphia, PA 19103) welcomes public comment on the standard. Do such standards work? Yes! The Pony Club's study provided dramatic indications that even its pre-ASTM standard had quite an effect. Comparing figures from before 1983 (when the USPC Standard went into effect) with those from 1983 to 1990 (when the Pony Club adopted ASTM F 1163), the study found a twenty-six-percent decrease in the number of reported head injuries and a sixty-two-percent decrease in the number of facial injuries. As for the newer standard, the American Medical Equestrian Association calculates that ASTM/SEI helmets have reduced all riding-related head injuries by thirty percent and severe head injuries by fifty percent. The helmet industry hasn't been content to rest on its approved laurels, however. Mindful that riders and teachers still grumble about looks and size and weight, manufacturers are constantly looking at ways to make their products more appealing - and every modification, of course, requires another round of testing. Among the latest wrinkles: an air-powered sizing-adjustment system not unlike the "pump" feature that's become so popular in basketball footwear. So what are you waiting for? The head you save will definitely be your own! When shopping for a helmet, go to a place where you can try one lots of them instead of just one or two. When I went to buy my helmet(the only one I've ever owned), they had gobs of them. I must have tried on a dozen or more before I found one that was my size and fit comfortably. I was amazed at the comfort when I tried it on, and when I ride with it, just like PG, I tend to forget it's there half the time. I have a Troxel Laredo, and I must admit that PG is right. Never look in the mirror when wearing your helmet. I think I look absolutely terrible in mine! But I wear it every time I ride... even though I did forget it once. Actually, I read in a book that was written for certifying riding instructors that you should be wearing a helmet any time that you are around horses, regardless if you are riding or not. If you think about it, this does make sense. A horse could knock you in the head as easily as you getting thrown on your head when riding. Why do I wear a helmet after not wearing one for most of my life? I've been listening to the good experienced folks here on DE, for one, and the other is that most of my riding buddies wear them, too. And after seeing a very good friend of mine get clipped by her horse's hoof in a freak accident with no injury to her head because she was wearing a helmet, you bet I'm going to wear one from now on. I'm not getting any younger as I reach the midway point of my 5th decade of life, and I want to survive to ride for many years yet to come . Helmets can give you a sense of security...not sure if I would call it false..maybe. I feel naked without one and makes me nervous if I don't have one. If the horse picks that up, might make horse anxious too. So, false security or not...if I am relaxed I reason my horse will hopefully be relaxed also. I've whacked two helmets now. One fall with helmet still got me racoon eyed....but I'd hate to think what COULD have happened without a helmet for either accident. Way I see it, not dangerous to wear one...and could save you from a major case of scrambled brains. Life is hard enough! Chuck also sells helmets in the saddle shop. I have a love/hate ralationshiop with my helmet.I look like a chubby toad with a helmet on,it is ugly,ugly,and oogly but 3 times I have hit my head while falling off and I know for a fact one of those times my brains would have been on pavement,so I love my helmet.It is a troxel(#3),not sure which one. I think you look just fine in your Helmet. What do you think folks? I think she looks good too. To tell you the truth, I didn't even notice she had a helmet on until you pointed it out....honest! Actually, who really does look good in a helmet? I don't know of anyone who does, they are just a necessary evil we all have to get used to. Pretty soon you just don't even think about it , you just put it on. I never look at someone else and think , wow look at that silly helmet! Well, she happens to be remarkably beautiful, so she would look good in an alien's skin hat, lol. Your photo didn't capture those knock-em-dead blue eyes, Hook. Thanks for the link. I think I'll start setting aside some cash for one of the helmets. One of my concerns was if they would fit with my long hair. Looks like they have them in my size. I'm thinking that I'll camo. paint the one that I get. Glad to hear you are going to get a Helmet. One day it just may save your life. Accidents DO happen and the ones left behind suffer most. Chuck has a great selection and his service and delivery are the best. A camouflage riding helmet may just be the next rage. I don't know if wearing a camoflaged (sp?) helmet would be wise. There are hunting seasons where I ride, and I definitely don't want me and my horse mistaken for a deer or anything else that someone might be willing to shoot me for . I've been shot at once, and it wasn't fun listening to that shotgun shell whizz over my head. If anything else, I wear hunter orange to make me more visible. I realize you are going to go hunting with your horse, Sharps, but there are some real crazies that come out of the woodwork... especially during deer season around here. Red Hawk, I thank you for your concern. 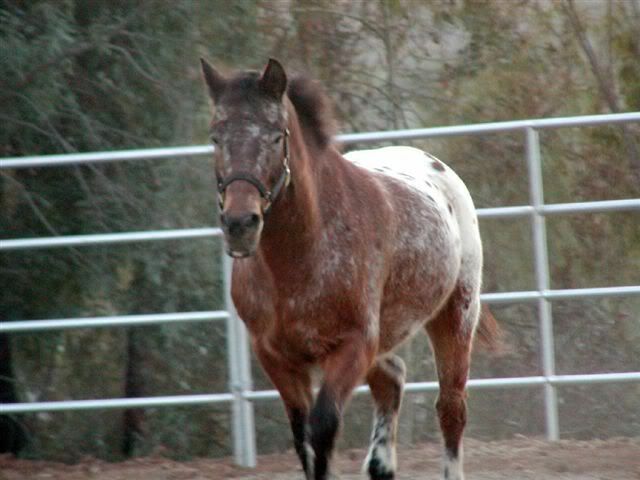 During hunting season my horse has blaze orange on front and rear. I was thinking camo mainly because when I go out into the forest for target shooting (which is about 3-4 days per week) I'm in camo or a sort of Gillie suit and can't be seen. Not only that, I just thought it would be kinda cool and might start a trend among some of the riders here that think a helmet is uncool or geeky looking. Hook, It's been going through my mind for some time now. So, tonight I called my wife and talked to her about the helmet thing and we came up with a change in rules for our students. Whereas before we required all students under 16 to wear a helmet. Now it's required of ALL students reguardless of age. I know that that will not set well with some. That's ok, I can refuse them if they refuse the rules. Do you know if there is a deal where I can buy more than one a save some cash? It might be an incentive for some of my less fortunate riders. Hook, It's been going through my mind for some time now. So, tonight I called my wife and talked to her about the helmet thing and we came up with a change in rules for our students. Whereas before we required all students under 16 to wear a helmet. Now it's required of ALL students regardless of age. I know that that will not set well with some. That's OK, I can refuse them if they refuse the rules. Do you know if there is a deal where I can buy more than one a save some cash? It might be an incentive for some of my less fortunate riders. I sincerely applaud your decision to have all of your students wear helmets. No one ever rides on one of our horses or on our property without one. I do not ever want to be responsible for some one getting hurt or killed when a helmet could have prevented a serious injury. I am also very glad that you as a responsible adult, in charge so to speak, are going to set an example. So many "trainers" and "coaches" fail to step up to their obligations. A very nice woman who we know quite well, made her students wear a helmet and ended up being thrown herself one day. Hit her head and died from her injuries. Had she worn her helmet she would be alive today. Check out the Helmets Chuck has for sale in theSaddleshop. They are approved made by a leading manufacturer and very reasonably priced at $34.95 with same day shipping. Send him an E-mail when you know the quantity and see if he can give you a better deal. Helmet! To me, it's become a no brainer choice (literally)! It's a simple question for anyone: Do you need your head for your work? The nutcracker for me is the dynamics. The head is the heaviest appendage of the body, yet it's held on by a relatively skinny and very scantily-muscled neck. It sure wouldn't take much of a hit in any direction to get your head whacked on something. We all love and trust our horses, but they are prey animals who can spook at any unpredictable moment, and it's smart to never underestimate that. My vote is for Troxel's "Dakota." I tried on a slew of helmets that seemed made for aliens with round heads. (The human skull from a bird's view is actually oval, slightly egg-shaped.) This one is adjustable in the back for comfortable fit, and it also comes with an insert to knock it down a size. It's hard to tell with a color difference, but it looks to me like that's what Beth is wearing in the photo above. Same visor, same cut-outs for ventilation. It's a pretty nice helmet. In any event, I'll spend $70 to protect "Ground Zero Command Central" any day, and as for the "helmet hair," pffffffft!! Love my new sierra helmet.Even frogs can look stylish in this helmet(Which I got from Chuck)LOL... Now to just find another truck as mine was totaled a couple of weeks back! !Thats another story!! Mrs Hook and I really like our Sierras too. What colour did you get? Too bad about your truck. Hope no one was injured! Thanks to everyone who says YES to helmets. I wouldn't be here today if I wasn't religious about wearing mine. Besides not wearing one at all, the other major mistake I see is people wearing them wrong. They can't protect your forehead if you wear it hanging loose off the back of your head. Also, be sure to replace yours if you have a bad crash. They're like bicycle helmets and are designed to compress (wreck themselves) instead of compressing your head. Speaking of bicycles helmets, I don't like to look like I'm wearing one when I ride, so I wear a traditional looking velvet helmet. But that's just me. I have a Troxel Grand Prix for schooling use, and a Charles Owen Show Jumper for dressage shows. They[re both great. Welcome to the Forum. You will find a hearty support for helmets on the Forum with almost 60% wearing helmets every time they ride. Check out the posts in the Helmet poll. Some powerful motivation there. Added link to current helmet post.